That is true ... 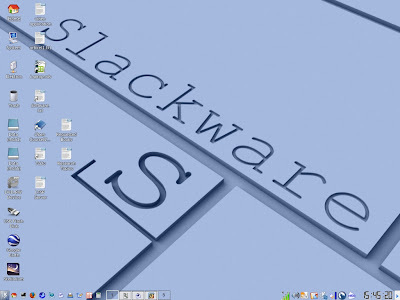 I fall in love with Slackware. First time I used Linux in the end of 2003, I installed Mandrake 9.1 (now Mandriva) on my PC, but, in the third month after installed, I was boring with that distro. I wanted something that gave me a big challenge. Then, I chose Slackware 9.1 in the beginning of 2004. First time using Slackware ... very stressful ... but ... I didn't give up ... then ... I was surprised, I became know about many processes related to how to operating system works ... and the most important thing ... I got "my own desktop" so that I can said "what do you see on screen is me" :) Thank's to Patrick Volkerding and the Slackware team for the BEST Linux distribution (your mileage may vary). In October 2006, I bought my first laptop (thank's to Ubaya and Mr. Yohanes G. Yusuf that help me financially to buy that laptop), a local trademark laptop: Relion TW12KM (AMD Turion64 1.8GHz, 1GB RAM, 60GB HDD, DVD-RW, 12.1" XGA TFT). When I was going to install Linux, I rather disappointed cause Slackware didn't have a x86_64 version (Until now, AFAIK, Pat don't have plan to release x86_64 version) ... oh .. no ... Did I had to "divorce" with Slackware? In the next few days, I got a good news from internet after searching using Google (thank's to Google for a wonderful search engine), there was a unofficial port of Slackware for x86_64 machine, that is, Slamd64 (www.slamd64.org). Thank's to Fred Emmott for this project, so that, until now, I can "live" with Slackware. I have changed the default icons using nuvoX 0.4. Also, I use Plastik as KDE Manager. The color of the desktop is contrast with the white case of my laptop.